The red-hot Indianapolis Colts (8-6; 7-6-1 ATS) are battling bravely to earn their place in the AFC playoffs, and the clash with the New York Giants (5-9; 7-6-1 ATS) could decide their future. The Colts have to win this game and are listed as huge favorites by the bookies, as the Giants don’t have a strong motive to upset the hosts. The New York Giants’ are playing another poor season, despite winning three of their last five showings. They are comingoff a 17-0 shutout defeat to the Tennessee Titans at home, recording just 15 1stdowns and converting only three of their 16 3rd downs against sturdyTitans’ defense. Saquon Barkley had 14 carries for 31 yards, and Eli Manningcompleted just 21 of his 44 passes, while the Giants obviously missed OdellBeckham who sat out the second game in a row and is still questionable for theclash against the Colts. The rookie RB Saquon Barkley is leading the way for the Giants this season with 1809 yards from scrimmage and 13touchdowns, while Odell Beckham has recorded 77 receptions for 1052 yards and six touchdowns in 12 starts thus far. Eli Manning has tossed for 3689 yards, 18touchdowns, and nine interceptions, completing 65.9% of his passes, but he’s averaging just 7.3 yards per pass attempt. The Giants are scoring 21.9 points(20th in the league) on 347.4 total yards per game (also 20th),allowing 46 sacks to their opponents. On the other side, they are surrendering24.9 points (23rd) on 365.8 total yards per contest (21st). The Indianapolis Colts have won seven of their previous eight games including a shutout victory over the Dallas Cowboys 23-0 at home this past Sunday. The Colts’ defense did a tremendous job against Ezekiel Elliott and his teammates, allowing them 292 total yards and 19 1st downs while sacking Dak Prescott three times. On the other side of the ball, the Colts run for 178 yards, completely controlling the game, while Andrew Luck threw for 192 yards without touchdowns and interceptions. The Colts are 5-2 straight up and 4-3 ATS in their seven home games this season, but they are on a five-game winning streak at Lucas Oil Stadium. Andrew Luck is leading the way for the Colts with 3951 yards, 34 touchdowns, and 13 interceptions, completing 67.3% of his passes. Marlon Mack is leading the backfield with 855 yards from scrimmage and eight touchdowns, while Nyheim Hines added 667 yards from scrimmage and three touchdowns. Tight end Eric Ebron has 59 receptions for 662 yards and whopping 13 touchdowns, whilst T.Y.Hilton has 67 catches for 1071 yards and six TD. The Colts are scoring 26.6 points (8th in the league) on 381.5 total yards per game (also 8th), allowing 21.4 points in a return (11th) on 341.5 total yards per contest (10th). The Colts are playing very well on both sides of the ball, and their brilliant defensive performance against theCowboys should be a huge boost for their self-confidence. Also, they’ve managed to score 23 points even with an indisposed Andrew Luck, so they look ready to beat the Giants and get one step closer to the post-season. The Giants on the other side will probably miss Odell Beckham, so Saquon Barkley will be ago-to-guy on their offense which means a lot of attention on the rookie. TheColts’ defense has improved drastically over the last few weeks, so I expectthem to dominate the one-dimensional Giants’ attack. Hereof, I’ll take theColts to cover on this one. Without Odell Beckham, the Giants will be in big trouble against the red-hot Indi’s defense. 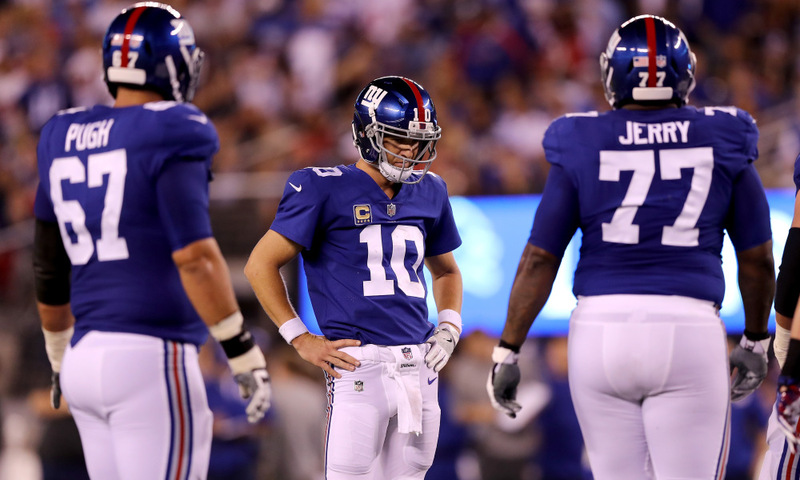 Their offensive line has been pretty fragile, allowing too many sacks on Eli Manning who’s obviously having an issue with his movement in the pocket. Saquon Barkley could get some points, or at least enable the Giants to hit the field goal, but the visitors should have a mountain to climb to surpass the 10-point mark here. On the other side, the Colts’ offense is capable of putting some serious numbers on the scoreboard, but I think they will worry more about the clock control, so I’m backing the under.